The midiDAC is a well specified single channel midi to analogue convertor. This project is a joint development between Oakley Sound and Trevor Page. The 5U high 2U wide panel layout for the MOTM format module. 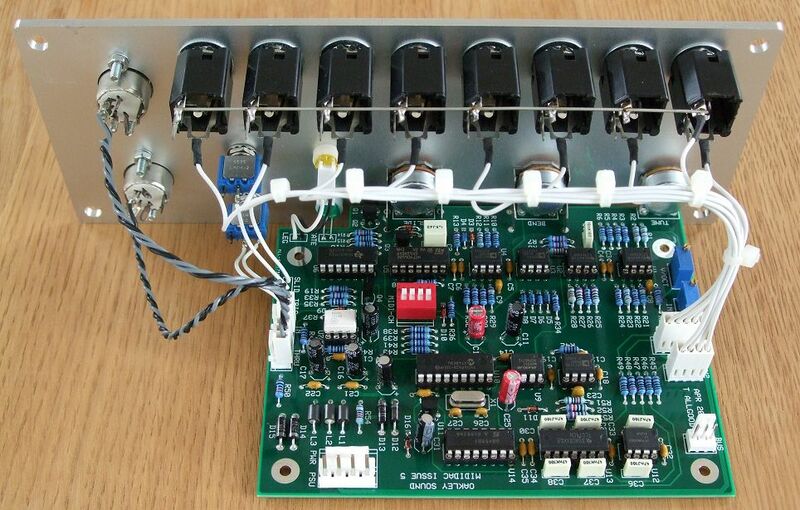 The midiDAC is designed to drive any 1V/octave synthesiser. However, it has been designed to fit beautifully into a MOTM or Oakley modular system. Let us first have a look at the different outputs available. Gate: +5V or +15V gate. Pitch CV: 128 steps of 12 bit accurate pitch voltage conforming to 1V/octave (trimmable). Pitch bend is added to this signal and can be trimmed to give the maximum bend interval. It can be trimmed to zero if required. Pitch Bend: This signal is available individually. It is bipolar; so with no bend, the output CV is zero. Velocity: 0 to 10V proportional to midi note on velocity. Aftertouch: 0 to 10V proportional to midi channel aftertouch. Legato: This signal goes to +5V when two notes are played at the same time. This can allow slides to be switched in at will; TB303 style. Modulation wheel: 0 to 10V proportional to mod wheel position. CC: Continuous controlled number 100. The outputs are available on two sets of 0.1" connectors at the top of the board but also interfaces directly to the Oakley CV/gate buss. The design also features a midi thru. Power (+/-15V) is provided to the board either by our standard Oakley 4-way header or Synthesizers.com header. Current consumption is approximately +40mA and -30mA. The midiDAC also includes a TB303 style slide circuit. This can be turned on and off manually, or by playing two notes at once. The pitch will glide up or down to the most recently pressed note. A pot can control the speed of the slide. There is a note stack within the firmware to allow the midiDAC to remember notes pressed. Thus if two or more notes are pressed at the same time, the oldest notes will be remembered so that if the more recent notes are removed the pitch will return to the still pressed older notes. New note retriggering can be switched in or out to suit your playing style. Note retriggering will allow you to play super fast keyboard runs. Each new note pressed will retrigger the synthesiser's envelopes irrespective of how many others are still held down. The suggested 19" wide 1U high midiDAC rack layout. A completed issue 4 midiDAC in a natural finish Scheaffer panel in MOTM format. The issue 4 PCB has been designed to fit within a double width MOTM or Dotcom style modular face plate or alternatively fitted to a 19" wide 1U high panel. It has three PCB mounted pots, tune, bend depth and slide time. The pots are spaced at 1.625". Midi channel is selected by four data lines in traditional binary fashion. Thus midi channel can be switched by either onboard DIP switches or links. This could also be done by a 16 position rotary HEX switch mounted on the front panel, but this is not provided on the standard midiDAC front panel designs. The pots I use on this module are the Alpha or Alps 16mm series. They use pot mounting brackets to ensure a firm connection to the front panel and PCB. They are strong enough to hold the PCB in place without any further support. Current draw is +40mA and -30mA for the +15V and -15V rails respectively. The PCB is double sided, has through plated holes, solder mask both sides and has full component legending. Board size is 111mm deep x 135mm high. The midiDAC pot bracket kit contains two 16mm pot brackets. The brackets are used to hold the PCB mounted 16mm Alpha pots safely to the PCBs. Ready made midiDAC modules may be available from Krisp1.com. Last revised: November 03, 2015.